We take care of the details while you get work done. Discover the best of Big Sky at Buck’s T-4 Lodge. Our lodge offers 9,000 sq. ft. of flexible meeting/banquet space and two breathtaking outdoor venues for receptions. Come and experience true Western hospitality with incomparable service as our staff attends to every detail of your program. Our largest meeting/banquet room, the versatile Montana Room, with its log beams and wood floor, will give your meeting attendees and guest the true flavor of Montana. The house sound system is equipped with touch Apple TV making slideshow presentations effortless. This room will seat up to 150 classroom and 225 for dinner service. 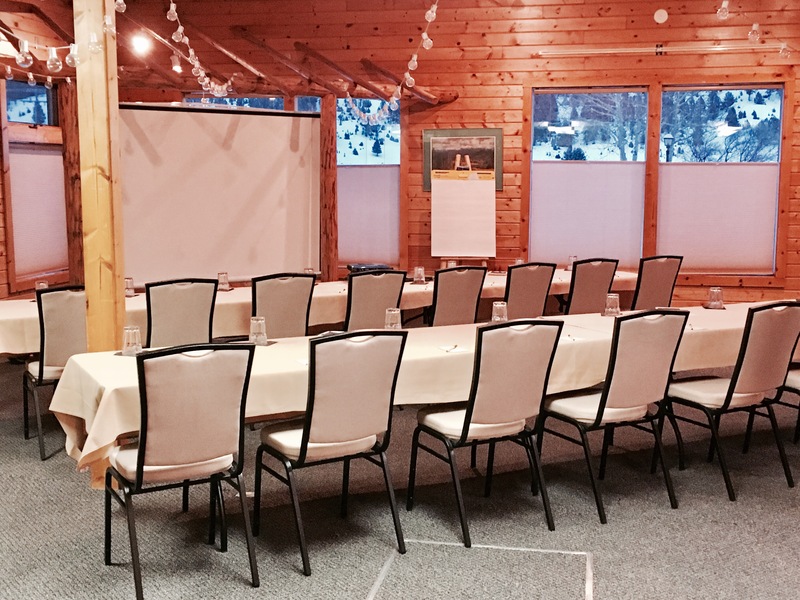 The Headwaters Room is the perfect spot for board meetings and other smaller gatherings. Ten large, comfortable chairs, custom wood table and screen help ensure an efficient meeting. The Bighorn Room accommodates medium-sized groups in a variety of configurations. The Bighorn Room comes equipped with a built-in screen and dry-erase board. This room is perfect for a conference group of 50 or less and also works well as a breakout meeting room. The Rainbow Room is designed for smaller groups in an intimate, waterfowl-themed setting. This room comes equipped with a built-in screen and dry-erase board. Our second largest meeting/banquet room. This room is bright and inviting with its large windows that face the mountain range. This room has its own exterior entrance allowing easy access. The meeting/banquet room can be set up in a variety of configurations making it very versatile. It also comes equipped with a built-in screen and portable sound system.